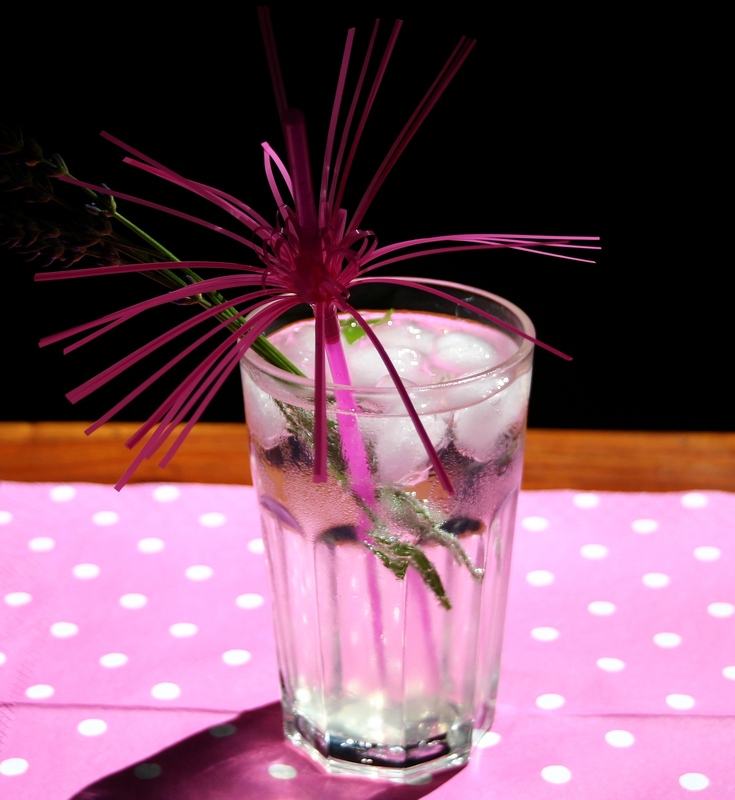 In the recent heatwave I fancied a cooling drink, so I made this delicious syrup to add to mineral water. With just a hint of lavender, and the lovely citrus tang, it really is very refreshing. 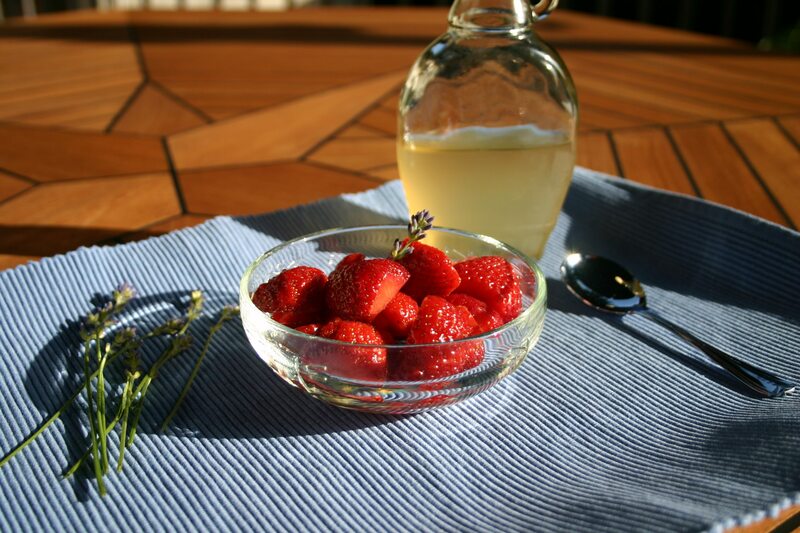 Or, if you happen to have some fresh strawberries, a spoonful drizzled over them works wonders too. Do you use lavender in the kitchen? This entry was posted in Food, Garden, Herbs & Spices, Recipes and tagged Drinks, Food, Garden, Herbs, Recipes, Summer, Vegetarian. Bookmark the permalink. I like the idea of this…mmm…Will take note so I can try it in the future. Sounds very interesting … not sure what the taste of lavender is like. I have also made lavender ice cream! It is scrumptious! The Lavender Lemon Syrup would be a fantastic addition to Lemon Pound Cake or any peach or apricot dessert! I am definitely going to try this when our lavenders flower, we just need a little sunshine now, this looks so pretty. This sounds good, ditto the ice-cream. I haven’t used my lavender in cooking yet as I feel I don’t have enough, I’ve tended to plant them with other things and I don’t have a border of them for example. I really should plant more. Any recommendations for the best variety for syrups etc.? You really don’t need much – just a few sprigs from one bush. I have no idea what mine all are, but I think mostly Lavender Angustifolia. I doubt if there’s much difference in the flavour, as so little is needed, and you can adjust the strength in drinks and ice cream anyway by steeping for longer. I have my lavenders dotted all over the garden between other plants too, but if you have space for a lavender border it would look wonderful! Die Fotos und die Rezepte gefallen mir sehr. Sie bringen die Sommerhitze wieder in Erinnerung :). Unfortunately I can’t grow enough to sacrifice. However I have been experimenting with herb syrups – the best so far is lemon verbena and lemon balm, but the recipe needs some work as it is too sweet. Lovely idea Marie! This syrup is very sweet and lemony too, so I just used sparkling mineral water here. Enjoy! Strawberries don’t last long here either… one of our dogs has learnt to pick the wild ones herself and chomps through the front garden every morning! LOL! Hi Cathy! Sorry I’ve not been by for ages. I’ve been so out of touch with everything! I’ve been really looking forward to catching up with your blog and I love these lavender recipes! I’ve never used lavender in cooking before, until this year I never knew you could eat it!!! Mine are just opening up too so I’ll give the syrup a go 🙂 Hope all is well with you. Lovely to hear from you Anna! Hope you get a chance to sit back and enjoy a glass of this, with a bit of sunshine too! Your lavender is ahead of mine, but I’m definitely trying this as soon as I can – strawberries and lavender syrup sounds like summer in a bowl! Lovely! Hope it’s not too hot! It looks beautiful! But it’s raining here today, so I want hot chocolate! 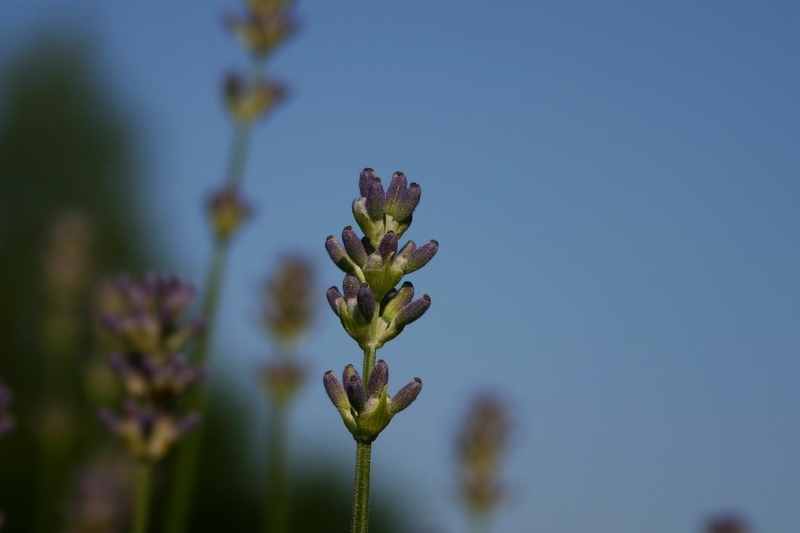 I have also been put off lavender in bought food as it is often dried lavender that is used – much too strong. If you make your own syrup or ice cream you can decide how strong you’d like it by infusing it longer. And fresh lavender is much more subtle. Hope you try it – it’s a lovely flavour! Gorgeous! I don’t think the lavender in the community garden is blooming yet…we can’t grow many kinds of lavender here as they’re not winter hardy but whatever cultivar our garden leaders planted, it’s going on three years strong. (I asked what they put in, thinking I would buy some plants for at home, but no one seems to know what type it is). Once it blooms, I will definitely try this! Looks so refreshing!